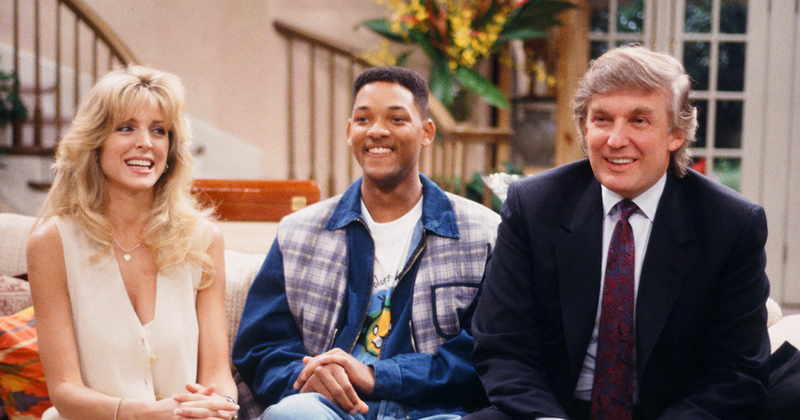 Remember when Donald Trump was in "The Fresh Prince of Bel-Air?" We love it when surprising people crop up in our favorite TV shows and movies. We love watching films like Spice World for a cameo from Meatloaf, or how about when Hilary Clinton appeared on Broad City? That’s why we’re completely losing it over Donald Trump’s cameo from The Fresh Prince of Bel-Air. Yup, before he was the Republican presidential candidate in the upcoming election, Donald Trump was just another famous name that would occasionally make appearances and cameos on TV and in movies. The famous businessman appeared in a 1994 episode of the Will Smith fronted sitcom, and Alfonso Ribeiro, who played Carlton on the show, relived the moment with People. In the clip, which People shared, Ribeiro’s character of Carlton can be seen getting very, very excited when he meets “The Donald.” In fact, his character becomes so overwhelmed by Donald Trump’s presence that he faints. Reviewing the encounter, Ribeiro said that he had different feels about Trump now then he did then. "I look at anything I’ve done on TV as acting. So that’s clearly that character and his opinions there," he said. "Back then, you could love the Donald,” he said. "Right now, I have a little different opinion of him. I try to stay away from the Donald." The actor, who won season 19 of Dancing with the Stars in 2014, did speak highly of Donald Trump’s ex-wife and fellow DWTS alumnus Marla Maples. "I saw Marla at the premiere this year of Dancing with the Stars and she's wonderful...She's amazing." Luckily, someone has uploaded the whole Donald Trump cameo on to YouTube.